This is a special outing for Basic Members only who are working with the ARTstarter calendar for October. Our theme this month is Perspective and the BIG exercise at the end of this month is to visit a local graveyard and read some epitaphs, and do some gravestone rubbings. This is an informal gathering where I will share some history and instruction, we'll do some practice - and then head on over to Santa Ana Cemetary (Fairhaven Memorial) where we have permission to respectfully walk through interesting gravestone and epitaphs that date back to the 1800's! Besides gravestones, rubbings are fun to do even around your house (find interested metal plates and engravings on furniture, walls, floors and more). 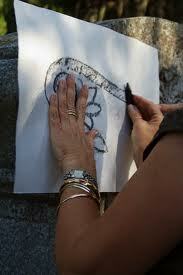 There are even tons of rubbings that you can add to your journal . . . all within a few minutes walking distance of The ARTbar -- memorial plaques, engraved people, fountain dedications, wall textures, cool backgrounds and more! Bring your journal for some reflection time, and also a kneeling pad/blanket in case the soil is moist. You may want to also bring a drink/snack for our picnic and sharing time - this is the fun part where we get to see what everyone else has found! Also a great chance to meet some other Basic Members - and do something you wouldn't normally do!